GAINESVILLE, Fla. (AP) — Kyle Aherns scored Michigan State’s final seven points, including a two-handed jam with 8.7 seconds remaining, and No. 10 Michigan beat Florida 63-59 on Saturday. Aherns barely beat the shot clock with his baseline slam, giving the Spartans the final points in a game the Gators made close thanks mostly to freshman Andrew Nembhard late. Florida (5-4) cut Michigan State’s lead to 56-53 on KeVaughn Allen’s 3-pointer with 3:24 to play, but Aherns answered from the corner on the other end. Aherns added a reverse layup on the Spartans’ next possession. The Gators forced a missed shot and a turnover, getting a chance to tie the game. But Allen missed an off-balanced shot going to the rim with 43 seconds to play. Aherns delivered the knockout blow on the other end, driving the baseline and stuffing one home. Nembhard and Allen led the Gators with 13 each. Nembhard made four of Florida’s last seven baskets and had assists on two others. Michigan State: The Spartans answered every Florida run. The Gators cut the lead to three late in the first half, and Cassius Winston hit a floater in the lane. Florida got it to four three times in the second half and Michigan State responded each time. Florida: Coach Mike White admittedly has a team built to shoot 3-pointers, and the Gators are tough to beat when they make them. But they missed 16 of 21 against the Spartans, getting few open looks. Michigan State’s visit completed a home-and-home series that opened in East Lansing three years ago. The return trip was pushed back because of renovations to the O’Connell Center in 2016 and then due to the Big Ten’s conference scheduling changes last year. Former Florida players Teddy Dupay, Casey Prather and Kasey Hill were in attendance. Be the first to comment on "No. 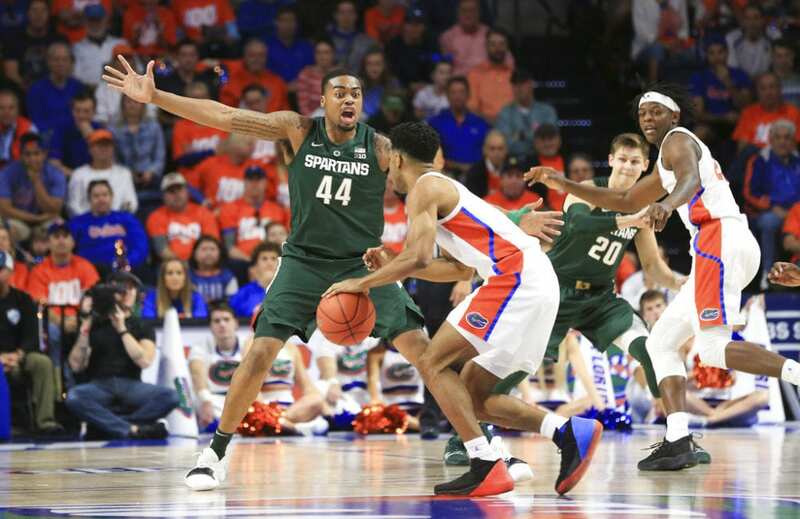 10 Michigan State Holds Off Florida Late, Wins 63-59"